The sense of smell is a powerful one that can benefit businesses. Smell has a great impact on customer perception; a survey found that 71% of customers believe malodour is a sign of poor cleaning practices. This decreases the chances of them returning. The part of the brain that perceives smells is connected to the parts that control emotion and associative learning, meaning that smells can quickly become related to places and events, and cause emotional responses. Smell also evades judgment and interpretation when it is perceived, making it the most accurate indicator of cleanliness. 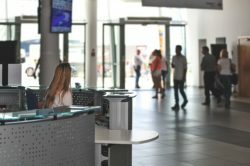 Preventing malodour in your facility is incredibly important; however, choosing the right air freshener is equally vital. There are factors to consider when choosing one, as having a great unit in the wrong place may create problems or fail to solve existing ones. We offer various models for all different kinds of spaces, ranging from as small as a single-occupant washroom, as large as a warehouse, or with odors as concentrated as a waste-holding area. The majority of our units are sustainable choices as they are low in volatile organic compounds (VOCs), have recyclable components, and are recycled at the end of their useful lives. Also, most come with the option of multiple scents or a scent-free neutralizer. Changing the fragrance periodically ensures that building occupants will prevent fragrance fatigue, while the neutralizers allow for malodour control without irritating those with sensitivities or allergies. Our EcoAire (left) and FreshAire (right) are made for rooms that are no larger than 6,000 cubic feet. The EcoAire is the milder option of the two, as it uses the airflow to continuously remove malodours and is an ideal choice for rooms with low ceilings and good airflow. 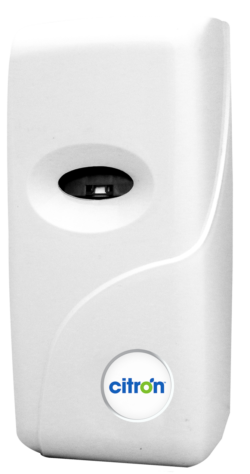 The FreshAire is battery-powered and effective in environments with low-to-medium airflow. Both units would work well in small washrooms (approximately 1-5 stalls), but the EcoAire is the ideal choice for a single-occupancy facilities. Banquet halls, common areas, and washrooms with five stalls or more, especially those with poor air circulation, require a stronger solution to prevent malodour. The Ultraire provides 20,000 cubic feet of coverage and is compliant with the California Air Resources Board regulations. Waste-holding areas, warehouses, and vast of public spaces need a powerful malodour control, and the AromaBeam (left) and AromAire (right) are exactly that. The AromaBeam covers 50,000 cubic feet and effectively freshens confined areas. The most powerful of them all is the AromAire, which covers 50,000-350,000 cubic feet, the widest range we offer, and is ideal for industrial settings. 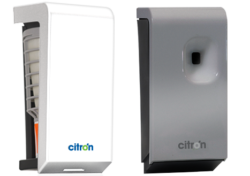 When businesses choose air fresheners from Citron Hygiene, they are making an environmentally responsible, quality decision. Call us today to set up a free consultation to learn more and see which one is the best choice for your space!